Nanomaterials are at the leading edge of the rapidly developing field of nanotechnology. Their unique size-dependent properties make these materials superior and indispensable in many areas of human activity. This brief review tries to summarise the most recent developments in the field of applied nanomaterials, in particular their application in biology and medicine, and discusses their commercialisation prospects. Nanotechnology  is enabling technology that deals with nano-meter sized objects. It is expected that nanotechnology will be developed at several levels: materials, devices and systems. The nanomaterials level is the most advanced at present, both in scientific knowledge and in commercial applications. A decade ago, nanoparticles were studied because of their size-dependent physical and chemical properties . Now they have entered a commercial exploration period [3, 4]. Living organisms are built of cells that are typically 10 μm across. However, the cell parts are much smaller and are in the sub-micron size domain. Even smaller are the proteins with a typical size of just 5 nm, which is comparable with the dimensions of smallest manmade nanoparticles. This simple size comparison gives an idea of using nanoparticles as very small probes that would allow us to spy at the cellular machinery without introducing too much interference . Understanding of biological processes on the nanoscale level is a strong driving force behind development of nanotechnology . Out of plethora of size-dependant physical properties available to someone who is interested in the practical side of nanomaterials, optical  and magnetic  effects are the most used for biological applications. The aim of this review is firstly to give reader a historic prospective of nanomaterial application to biology and medicine, secondly to try to overview the most recent developments in this field, and finally to discuss the hard road to commercialisation. Hybrid bionanomaterials can also be applied to build novel electronic, optoelectronics and memory devices (see for example [9, 10]). Nevertheless, this will not be discussed here and will be a subject of a separate article. As mentioned above, the fact that nanoparticles exist in the same size domain as proteins makes nanomaterials suitable for bio tagging or labelling. However, size is just one of many characteristics of nanoparticles that itself is rarely sufficient if one is to use nanoparticles as biological tags. In order to interact with biological target, a biological or molecular coating or layer acting as a bioinorganic interface should be attached to the nanoparticle. Examples of biological coatings may include antibodies, biopolymers like collagen , or monolayers of small molecules that make the nanoparticles biocompatible . In addition, as optical detection techniques are wide spread in biological research, nanoparticles should either fluoresce or change their optical properties. The approaches used in constructing nano-biomaterials are schematically presented below (see Figure 1). Typical configurations utilised in nano-bio materials applied to medical or biological problems. Nano-particle usually forms the core of nano-biomaterial. It can be used as a convenient surface for molecular assembly, and may be composed of inorganic or polymeric materials. It can also be in the form of nano-vesicle surrounded by a membrane or a layer. The shape is more often spherical but cylindrical, plate-like and other shapes are possible. The size and size distribution might be important in some cases, for example if penetration through a pore structure of a cellular membrane is required. The size and size distribution are becoming extremely critical when quantum-sized effects are used to control material properties. A tight control of the average particle size and a narrow distribution of sizes allow creating very efficient fluorescent probes that emit narrow light in a very wide range of wavelengths. This helps with creating biomarkers with many and well distinguished colours. The core itself might have several layers and be multifunctional. For example, combining magnetic and luminescent layers one can both detect and manipulate the particles. The core particle is often protected by several monolayers of inert material, for example silica. Organic molecules that are adsorbed or chemisorbed on the surface of the particle are also used for this purpose. The same layer might act as a biocompatible material. However, more often an additional layer of linker molecules is required to proceed with further functionalisation. This linear linker molecule has reactive groups at both ends. One group is aimed at attaching the linker to the nanoparticle surface and the other is used to bind various moieties like biocompatibles (dextran), antibodies, fluorophores etc., depending on the function required by the application. Natural bone surface is quite often contains features that are about 100 nm across. If the surface of an artificial bone implant were left smooth, the body would try to reject it. Because of that smooth surface is likely to cause production of a fibrous tissue covering the surface of the implant. This layer reduces the bone-implant contact, which may result in loosening of the implant and further inflammation. It was demonstrated that by creating nano-sized features on the surface of the hip or knee prosthesis one could reduce the chances of rejection as well as to stimulate the production of osteoblasts. The osteoblasts are the cells responsible for the growth of the bone matrix and are found on the advancing surface of the developing bone. The effect was demonstrated with polymeric, ceramic and, more recently, metal materials. More than 90% of the human bone cells from suspension adhered to the nanostructured metal surface , but only 50% in the control sample. In the end this findings would allow to design a more durable and longer lasting hip or knee replacements and to reduce the chances of the implant getting loose. Titanium is a well-known bone repairing material widely used in orthopaedics and dentistry. It has a high fracture resistance, ductility and weight to strength ratio. Unfortunately, it suffers from the lack of bioactivity, as it does not support sell adhesion and growth well. Apatite coatings are known to be bioactive and to bond to the bone. Hence, several techniques were used in the past to produce an apatite coating on titanium. Those coatings suffer from thickness non-uniformity, poor adhesion and low mechanical strength. In addition, a stable porous structure is required to support the nutrients transport through the cell growth. It was shown that using a biomimetic approach – a slow growth of nanostructured apatite film from the simulated body fluid – resulted in the formation of a strongly adherent, uniform nanoporous layer . The layer was found to be built of 60 nm crystallites, and possess a stable nanoporous structure and bioactivity. A real bone is a nanocomposite material, composed of hydroxyapatite crystallites in the organic matrix, which is mainly composed of collagen. Thanks to that, the bone is mechanically tough and, at the same time, plastic, so it can recover from a mechanical damage. The actual nanoscale mechanism leading to this useful combination of properties is still debated. An artificial hybrid material was prepared from 15–18 nm ceramic nanoparticles and poly (methyl methacrylate) copolymer . Using tribology approach, a viscoelastic behaviour (healing) of the human teeth was demonstrated. An investigated hybrid material, deposited as a coating on the tooth surface, improved scratch resistance as well as possessed a healing behaviour similar to that of the tooth. Photodynamic cancer therapy is based on the destruction of the cancer cells by laser generated atomic oxygen, which is cytotoxic. A greater quantity of a special dye that is used to generate the atomic oxygen is taken in by the cancer cells when compared with a healthy tissue. Hence, only the cancer cells are destroyed then exposed to a laser radiation. Unfortunately, the remaining dye molecules migrate to the skin and the eyes and make the patient very sensitive to the daylight exposure. This effect can last for up to six weeks. To avoid this side effect, the hydrophobic version of the dye molecule was enclosed inside a porous nanoparticle . The dye stayed trapped inside the Ormosil nanoparticle and did not spread to the other parts of the body. At the same time, its oxygen generating ability has not been affected and the pore size of about 1 nm freely allowed for the oxygen to diffuse out. The ever increasing research in proteomics and genomic generates escalating number of sequence data and requires development of high throughput screening technologies. Realistically, various array technologies that are currently used in parallel analysis are likely to reach saturation when a number of array elements exceed several millions. A three-dimensional approach, based on optical "bar coding" of polymer particles in solution, is limited only by the number of unique tags one can reliably produce and detect. Single quantum dots of compound semiconductors were successfully used as a replacement of organic dyes in various bio-tagging applications . This idea has been taken one step further by combining differently sized and hence having different fluorescent colours quantum dots, and combining them in polymeric microbeads . A precise control of quantum dot ratios has been achieved. The selection of nanoparticles used in those experiments had 6 different colours as well as 10 intensities. It is enough to encode over 1 million combinations. The uniformity and reproducibility of beads was high letting for the bead identification accuracies of 99.99%. 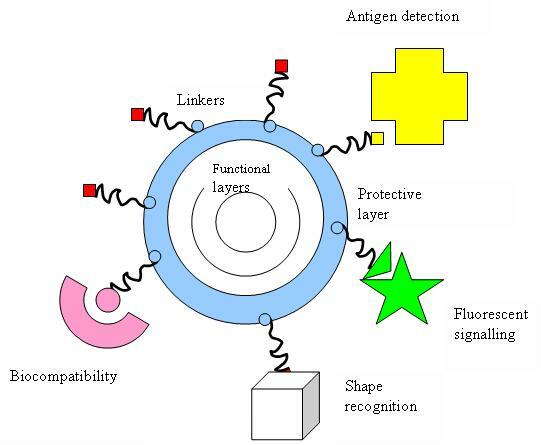 Functionalised magnetic nanoparticles have found many applications including cell separation and probing; these and other applications are discussed in a recent review . Most of the magnetic particles studied so far are spherical, which somewhat limits the possibilities to make these nanoparticles multifunctional. Alternative cylindrically shaped nanoparticles can be created by employing metal electrodeposition into nanoporous alumina template . Depending on the properties of the template, nanocylinder radius can be selected in the range of 5 to 500 nm while their length can be as big as 60 μm. By sequentially depositing various thicknesses of different metals, the structure and the magnetic properties of individual cylinders can be tuned widely. As surface chemistry for functionalisation of metal surfaces is well developed, different ligands can be selectively attached to different segments. For example, porphyrins with thiol or carboxyl linkers were simultaneously attached to the gold or nickel segments respectively. Thus, it is possible to produce magnetic nanowires with spatially segregated fluorescent parts. In addition, because of the large aspect ratios, the residual magnetisation of these nanowires can be high. Hence, weaker magnetic field can be used to drive them. It has been shown that a self-assembly of magnetic nanowires in suspension can be controlled by weak external magnetic fields. This would potentially allow controlling cell assembly in different shapes and forms. Moreover, an external magnetic field can be combined with a lithographically defined magnetic pattern ("magnetic trapping"). Proteins are the important part of the cell's language, machinery and structure, and understanding their functionalities is extremely important for further progress in human well being. Gold nanoparticles are widely used in immunohistochemistry to identify protein-protein interaction. However, the multiple simultaneous detection capabilities of this technique are fairly limited. Surface-enhanced Raman scattering spectroscopy is a well-established technique for detection and identification of single dye molecules. By combining both methods in a single nanoparticle probe one can drastically improve the multiplexing capabilities of protein probes. The group of Prof. Mirkin has designed a sophisticated multifunctional probe that is built around a 13 nm gold nanoparticle. The nanoparticles are coated with hydrophilic oligonucleotides containing a Raman dye at one end and terminally capped with a small molecule recognition element (e.g. biotin). Moreover, this molecule is catalytically active and will be coated with silver in the solution of Ag(I) and hydroquinone. After the probe is attached to a small molecule or an antigen it is designed to detect, the substrate is exposed to silver and hydroquinone solution. A silver-plating is happening close to the Raman dye, which allows for dye signature detection with a standard Raman microscope. Apart from being able to recognise small molecules this probe can be modified to contain antibodies on the surface to recognise proteins. When tested in the protein array format against both small molecules and proteins, the probe has shown no cross-reactivity. Some of the companies that are involved in the development and commercialisation of nanomaterials in biological and medical applications are listed below (see Table 1). The majority of the companies are small recent spinouts of various research institutions. Although not exhausting, this is a representative selection reflecting current industrial trends. Most of the companies are developing pharmaceutical applications, mainly for drug delivery. Several companies exploit quantum size effects in semiconductor nanocrystals for tagging biomolecules, or use bio-conjugated gold nanoparticles for labelling various cellular parts. A number of companies are applying nano-ceramic materials to tissue engineering and orthopaedics. Examples of Companies commercialising nanomaterials for bio- and medical applications. KES Science and Technology, Inc. Most major and established pharmaceutical companies have internal research programs on drug delivery that are on formulations or dispersions containing components down to nano sizes. Colloidal silver is widely used in anti-microbial formulations and dressings. The high reactivity of titania nanoparticles, either on their own or then illuminated with UV light, is also used for bactericidal purposes in filters. Enhanced catalytic properties of surfaces of nano-ceramics or those of noble metals like platinum are used to destruct dangerous toxins and other hazardous organic materials. As it stands now, the majority of commercial nanoparticle applications in medicine are geared towards drug delivery. In biosciences, nanoparticles are replacing organic dyes in the applications that require high photo-stability as well as high multiplexing capabilities. There are some developments in directing and remotely controlling the functions of nano-probes, for example driving magnetic nanoparticles to the tumour and then making them either to release the drug load or just heating them in order to destroy the surrounding tissue. The major trend in further development of nanomaterials is to make them multifunctional and controllable by external signals or by local environment thus essentially turning them into nano-devices.